Alfa Romeo is showing off its high-performance premium SUV to the world. Today, it unveiled the 2018 Alfa Romeo Stelvio Quadrifoglio at Auto China. It also debuted the SUV to automotive journalists in Chicago, Illinois. While the vehicle itself is stunning, many may be stunned by the SUV’s performance. The 2018 Alfa Romeo Stelvio Quadrifoglio boasts 505 horsepower and has a top speed of 176 MPH. The Stelvio Quadrifoglio set a new record for its class on the famous Nurburgring: 7 minutes 51.7 seconds. It does 0-60 MPH in 3.6 seconds. The Stelvio Quadrifoglio is powered by a 2.9-liter twin-turbo V-6 engine. Ferrari reportedly helped with the technology and engineering know-how. The engine is paired with an eight-speed automatic transmission. Because the Stelvio Quadrifoglio will handle like a race car, it is also equipped with aluminum paddle shifters. Alfa Romeo uses ultra-lightweight materials, such as carbon fiber for the driveshaft and aluminum for the engine, suspensions, brakes, doors, wheel-wells, hood and tailgate. The premium materials will help keep the weight down while improving the fuel economy. 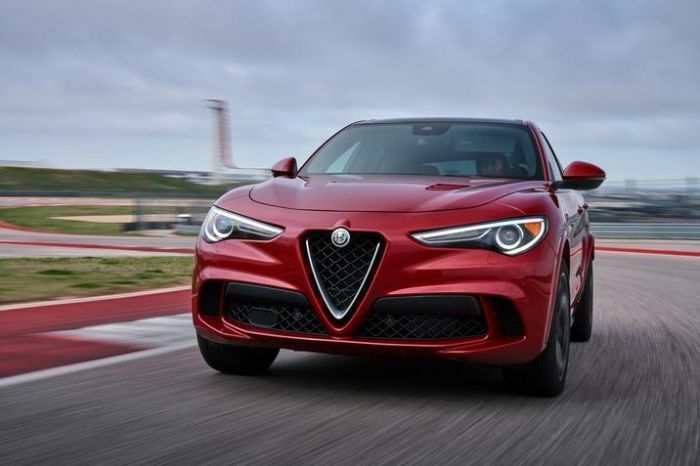 Because the Stelvio Quadrifoglio is already high-end, it offers few options. The driver can upgrade to special high-performance Brembo carbon-ceramic brakes. If you are really searching for the race-car experience, you can also upgrade to Sparco seats designed for intense driving experiences. According to the Alfa Romeo website, the 2018 Stelvio Quadrifoglio will sticker starting at $79,995 before taxes and delivery fees. It should be available in the U.S soon. Alfa Romeo has several other vehicles already on sale in the U.S. There is a less powerful Stelvio SUV model. There is also a beautiful Giulia sedan and more powerful Giulia Quadrifoglio. They also have two sporty cars, the 4C Coupe and 4C Spider.